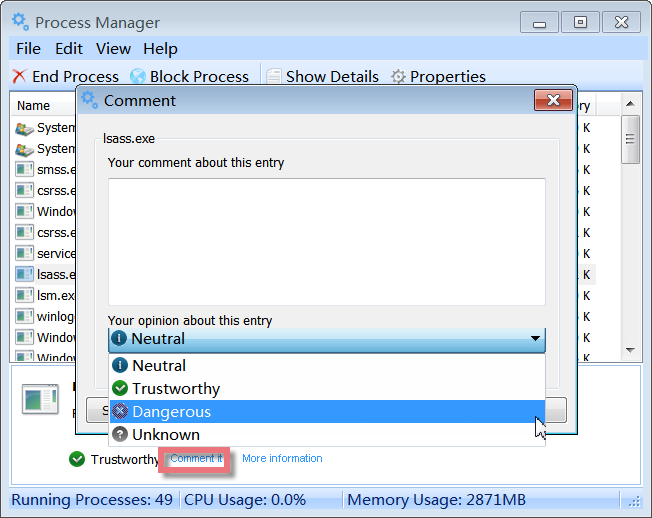 Process Manager is an enhanced yet easy-to-use task manager that provides advanced information about programs and processes running on the computer, and offers a unique security risk rating for determining whether the running process should be terminated or removed. 1. The Second Line Button: quick access button to end/block or show more details on the selected running process. 2. Upper box: displays all running processes with their logo, file name, security risk rating, CPU time and memory usage. 3. Lower box: shows detailed information on a selected running process, such as process name, product it belongs to, company that produced this process, and whether it is Trustworthy or Safer or Neutral or Dangerous or Unknown. 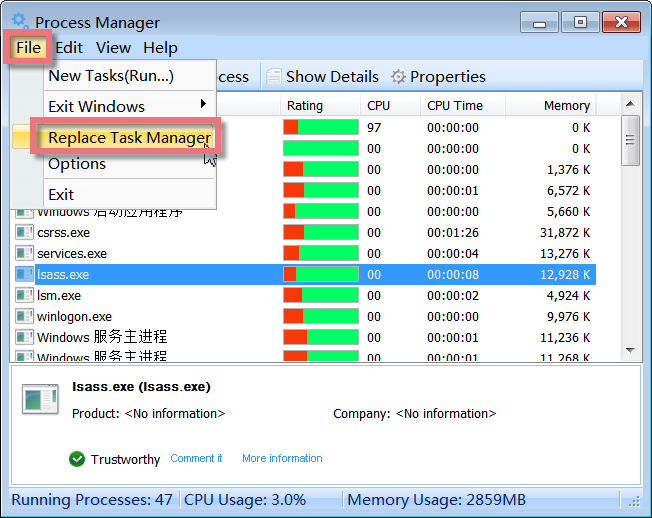 Process Manager is an enhanced task manager that displays detailed information about programs and processes running on the computer. 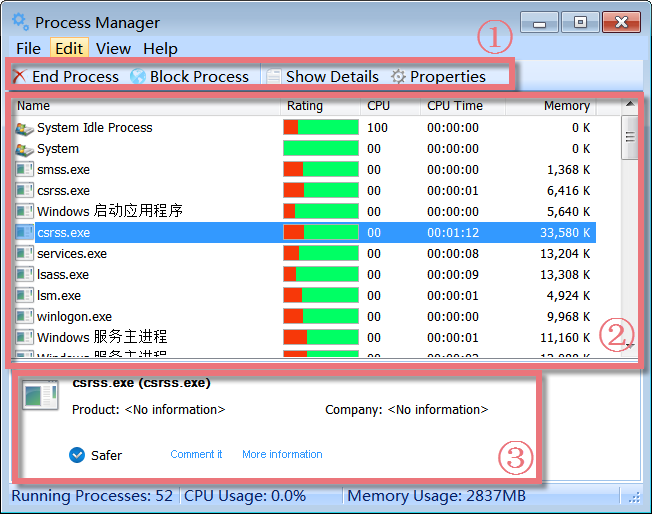 It shows all the standard information, including file name, description, CPU usage and a unique security risk rating for determining whether the running process should be terminated or blocked. 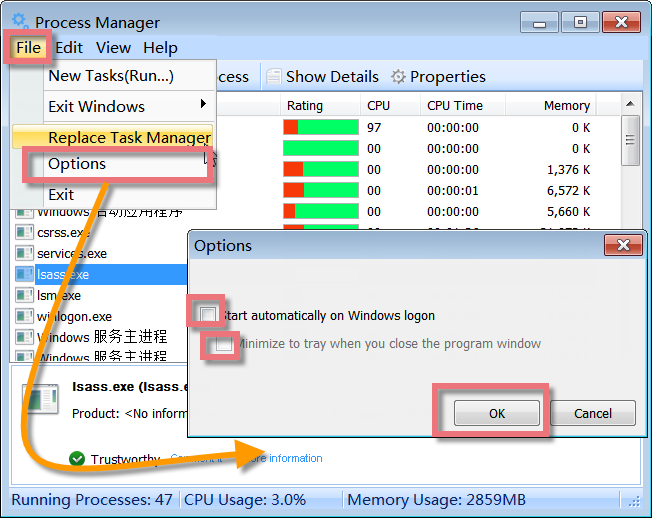 Click from "File" menu and select "Replace Task Manager", Process Manager will integrate itself into your system so that you can access the module by pressing Ctrl+Alt+Del, or by right clicking on an empty part of the taskbar and selecting Task Manager. If you want to use the Windows Task Manager again, simply select the same menu item to remove the check mark in front of it. Process Manager has a unique risk rating which is quite conclusive. It shows a list of the risk rating and allows you to determine whether the process should be terminated or removed. The green/red bars directly indicate the risks and necessity index for each process. The longer the green part is, the safer the running process is. Quite the contrary, the longer the red part is, the more dangerous the running process is. Therefore, you can remove the running process with a totally red bar and be careful to those with longer red bars. If all these information is not enough for your reference, you can also refer to other users' experience with a particular process through a click on the interface. Click the process that you want to end/block, and then click End/Block Process. Be careful when ending a process. If you end an application, you will lose unsaved data. If you end a system service, some part of the system might not function properly. 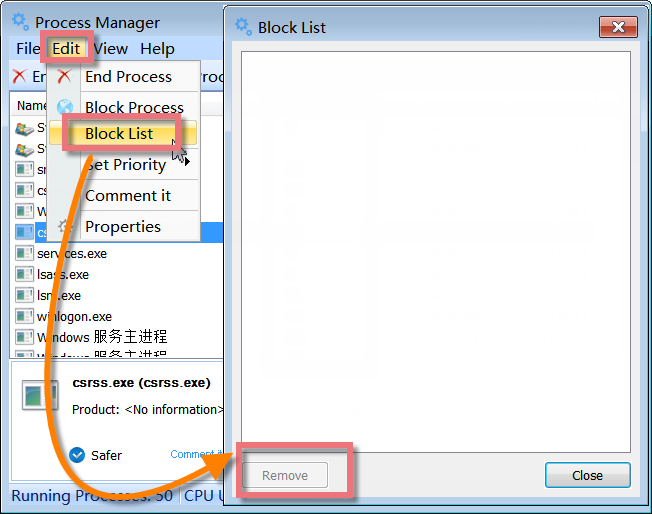 All the process blocked will be recorded in the block list, which can be accessed from "Edit" menu. If you want to unblock a process, please directly remove it out of the block list. Click from "File" menu and select "Options", a box will pop up. If you want to stop/start Process Manager on Windows logon, you can decide whether to checkup the box before "Start automatically on Windows logon" or not. On the Processes tab, click the column heading you want to sort by. To reverse the sort order, click the column heading a second time. You can sort your running processes by Name, Rating, Priority, CPU, CPU Time and Memory. Process Manager collects process comments from all users. You can comment a process and contribute your ideas to help or discuss with other users. Select a process, and click "Comment it" in the details box. You can give your opinions Trustworthy or Neutral or Dangerous or Unknown, then describe your ideas and click "submit". You comments will be shared with other users once reviewed. If you come across an unknown process, you can click "more information" to learn other users' experience with this process you don't know. Click "Processes", Process Manager will pop up. Find and click Process Manager icon in the Dock bar, Process Manager will appear. If Process Manager is not in the Dock bar, click in Dock bar, Process Manager will show in a new popup window. Please note: if you want to add Process Manager in the Dock bar, click in Dock bar, remove any icon by dragging it out of the Dock firstly, and then drag Process Manager in.